Thanks to Leroy once again for this info. Selena is on the cover and there is a one page article in this week's FURIA MUSICAL. It is about the Houston Astrodome's Rodeo Concerts and how Selena continues to hold the attendence record after 6 years. This magazine is dated February 14, 2001, so it will be gone soon! - February 22, 2001 - Selena Musical News, Start Up Date is March 28, 2001! Whether you've always been a Selena fan or only recently discovered her music, we invite all Selena fans to experience her final live performance in Houston, Texas. Now is your chance to become one of the more than 64,000 fans in attendance that evening. Singing and dancing with that spectacular voice and figure we all remember, this exciting concert is Selena at her best. 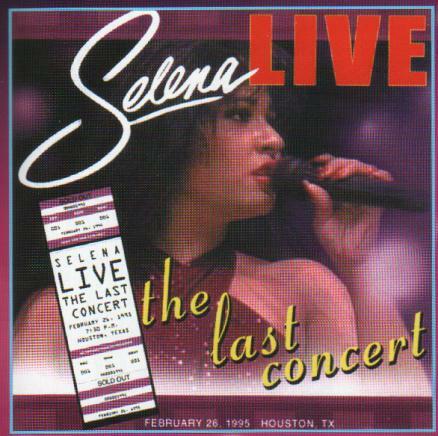 This newsletter also contains this Description of the album: BIO/ARTIST PROFILE: The release of "Selena Live, The Last Concert" commemorates her triumphant and sadly, last live concert performance before her tragic death six years ago on March 31, 1995. That boisterous show at the Houston Astrodome broke a record attendance of more than 64,000 screaming fans as they sang along in Spanish and English to an assortment of infectious songs spanning musical genres covering Tejano, disco, pop and R&B. This smashing performance Illustrated her potential to enter the global musical arena. Endowed with a charismatic personality that surpassed language and culture, her universal appeal has reached millions around the world. Selena's emotive last live performance is now beautifully captured on this CD. This much anticipated 12 track compilation will keep Selena's artistic legacy alive through her music. Selena's father is still working on the video release of this concert, will keep you posted! Thanks to Pete for this information as well. The answer was very simple, according to EMI Latin in San Antonio the reasons that "Selena y Sus Inicios Vol.1" are that a.) The material on the disc is Selena's pre-EMI recordings , you were right Cyn! lol ;) and b.) Selena's father, Mr. Quintanilla, wanted this to be a project for his company and record label @ Q-Productions Inc which is based out of Corpus Christi TX. This CD will be released nationwide on February 21, 2001 (According to www.cduniverse.com and www.cdnow.com, which now have this CD on sale). After 12 years of being President of EMI Latin, Jose Behar, the man who wanted to find the next Gloria Estefan and did with Selena, will resign on March 31, 2001. Selena was Behar's first artist when he founded EMI Latin in 1989, and molded her into the Tejana crossover sensation that she became. He discovered Selena at the 1988 Tejano Music Awards, and her first EMI Latin Album "Selena" was released in October 1989. "I have had a great run at EMI, and will always be grateful for having been given the opportunity to build a great record company, which I know will thrive for years to come," said Behar. Ken Berry, President EMI Recorded Music, said: "I would like to take this opportunity to thank Jose for his excellent contribution in the creation of EMI's US Latin operation. After 12 years of solidly building the company I wish him well in his future endeavors." Jose Behar was depicted in both "Selena" The Motion Picture and "Selena Forever" The Broadway-Bound Musical. 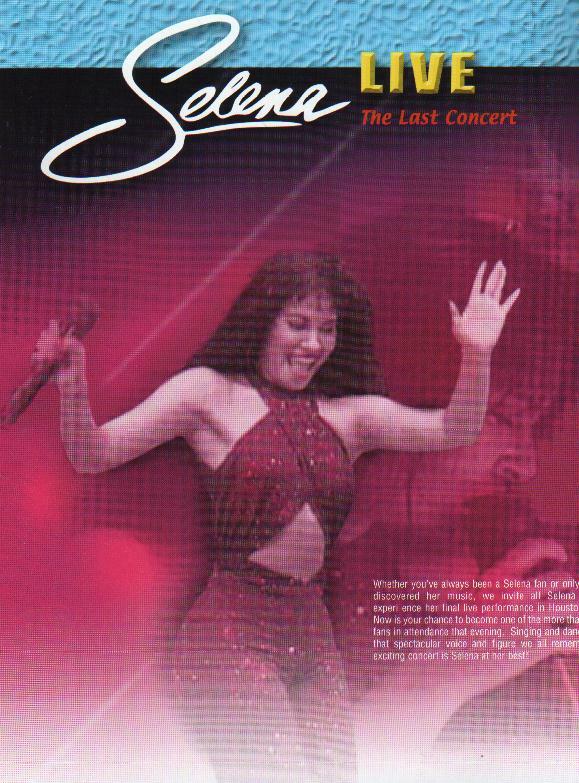 And his final Selena project as EMI Latin CEO will be "Live: The Last Concert"
Last Night I sent an email to People En Espanol because they did not even mention Selena in their March 2001 issue. I would like for all of the visitors in to this site to do this also. It does not need to be long, in fact I think if they are shorter, it will be easier for them to get them all. But you can write however long you want, in English and in Spanish. I was just told that a possible release date for this album is March 6, 2001. I will post more information on this site as soon as I get this confirmed. So if "Selena y Sus Inicios Vol.1" is released on March 6, 2001 this means that the other albums in this collection are scheduled (approx.) to be released on these dates: Vol.2 - December 2001, Vol.3 - September 2002, Vol.4 - June 2003 and Vol.5 - March 2004. This is based on the 9 month cycle that Q-Productions said they would be released in. NOW CONFIRMED: Borders Books and Music have this album set for a March 6, 2001 release date. And it will be distributed by Southwest Wholesale under the authorization of Q-Records. I went to www.emilatin.com and there it is, listed for a March 27, 2001 release date! This is really exciting since this is one of the most anticipated Selena titles in a really long time. This release date is for the CD, there is no info on the site about the VHS of this concert. Will keep you posted. The title listed at the site is "Live: The Last Concert". The Selena musical, which was supposed to premire last Wednesday, still has not made any new announcments. I will post news here as soon as I get it. They postponed they musical from January to February becuase of ongoing union contract negotiations, so this may be the reason once again for this delay. Thanks to Leroy, for this information. Selena is nominated for a Latin Billboard Award this year under the Latin Greatest Hits Album Of The Year Category for her album "All My Hits - Todos Mis Exitos Vol.2"!!!! Congratulations Selena!!!! For more information please visit www.billboard.com. Please check out the add on news for the February 8, 2001 story below! The Picture to your left (The picture is now stored in this sites Discography Section) is the cover art of the first CD in this series. It is available for purchase at www.q-productions.com at $14.98 (CD), cassettes also available. I will try to call tomorrow to check if it is available now, or if its on pre-order status. Telemundo will be paying tribute to Selena all night on Sunday, February 11, 2001. They will air a special called "Recordando a Selena" at 7 PM and "Selena" the movie at 8:00 PM. As previously reported, "Selena" will be dubbed in Spanish for this special presentation. The film was previously aired on ABC with an optional SAP Spanish Track, which was the first time this was done in the history of the station. I am not sure if this special is a new one, but the one shown in 1995 was called "Recordandote Con Amor" and the one in 1999 was "Selena: Siempre Te Recordamos", so it could be new. Check your local listings for details. Billboard published an article about A.B and his Kumbia Kings and their upcoming release. ``It should have been an English album, and one month later, a Spanish album,'' says Quintanilla, who was slated to record in English with Capitol but declined the offer. Already armed with a set of English tracks, he decided to include them on his Spanish album with EMI Latin. Having more Spanish than English tracks was simply a marketing decision to ensure the album would be considered Latin by organizations like the Recording Industry Assn. of America and the Grammys. Selena's Next album "The Early Years - Sus Inicios Vol.1" is now listed for pre-order at www.amazon.com, as well. The release date there is also 1/1/10, I was informed that this is because there is no confirmed release date set, but it will be within the next couple of months. Selena: Celebration Of Life Tickets are still not on sale, if you live in the Texas or L.A/Hollywood area and have some information as to win tickets will go on sale, please email me: selboyfan1@aol.com. All I get when I call the theater is a recording saying that there are no productions running. The opening is supposed to be February 14, 2001, so I don't know how they are going to sell the tickets unless it's pushed back some more. "El próximo domingo, también por KVEA Canal 52, se transmitirá la película biográfica de la reina del tex-mex Selena con Jennifer López. En esta cinta López es aclamada. por su genial interpretación de Selena Quintanilla Pérez, quien fue asesinada por la presidenta de su propio club de admiradoras. El filme cuenta la vida de la cantante desde su infancia hasta su muerte, a finales del mes de marzo de 1995 en Corpus Christi, Texas." Jennifer Lopez' "Anaconda" is also set to air one week after "Selena". Two online stores on at www.gemm.com, have the new Selena album slated for a February Release date. I am hoping this is true, but delays are always possible. Please check back here for a confirmation when/if it arises. Until then, stay excited for this new Selena release that will contain songs from her first (very first) albums.